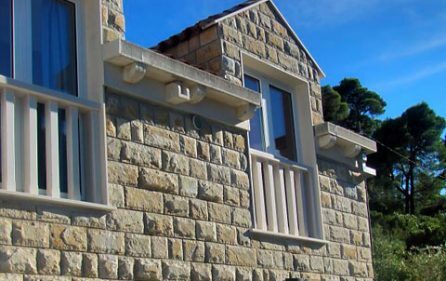 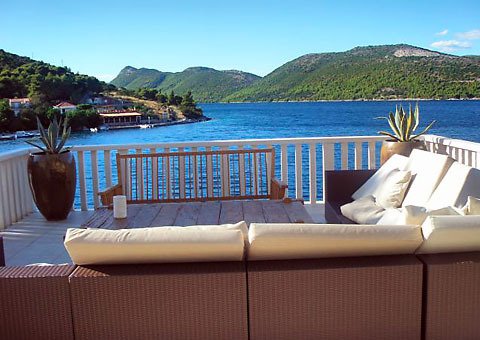 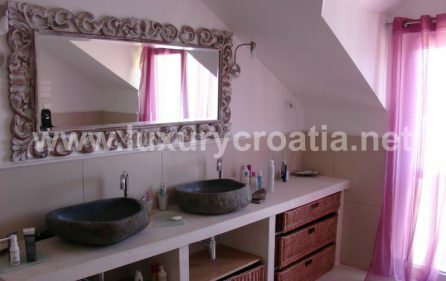 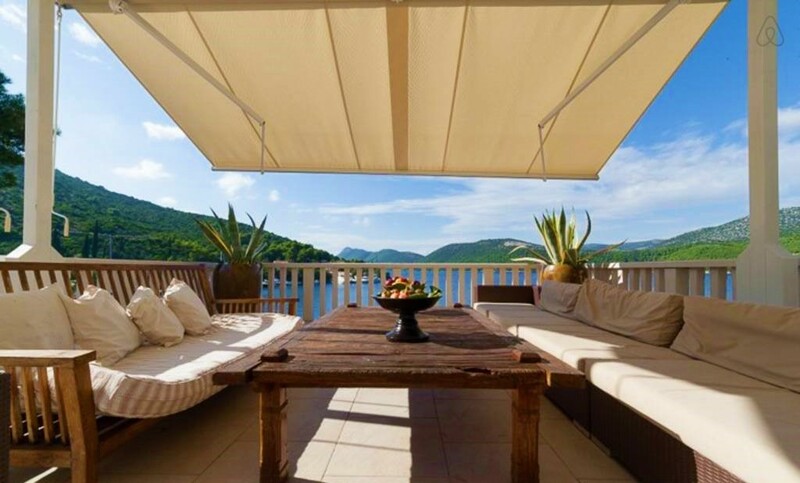 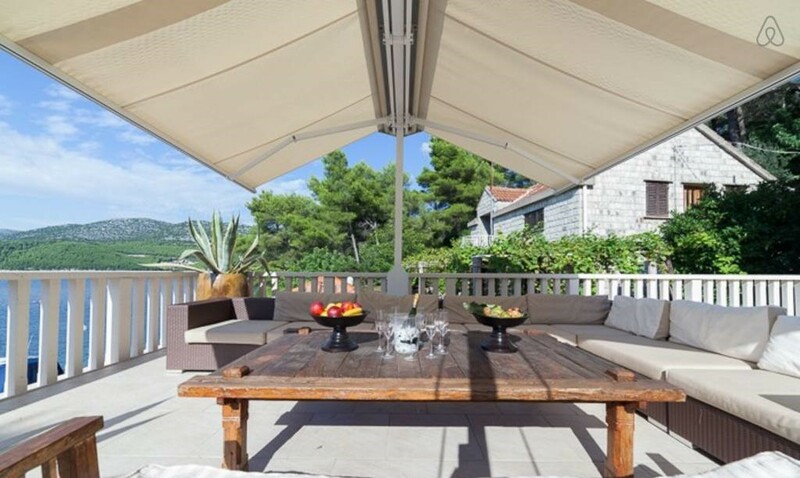 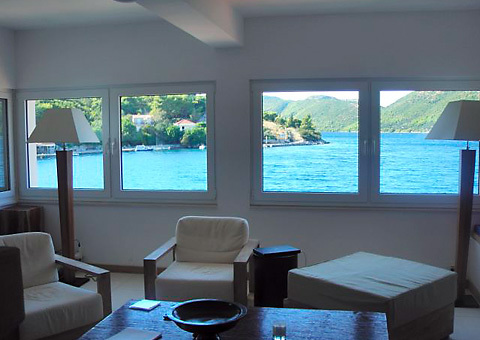 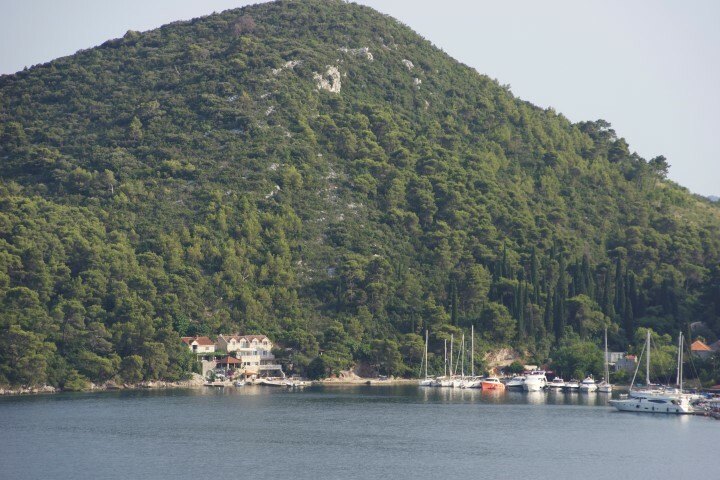 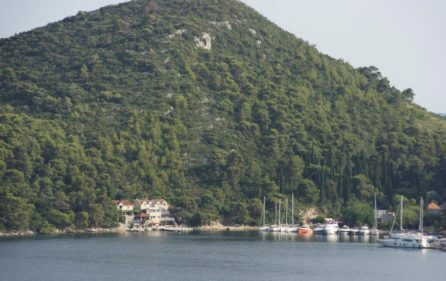 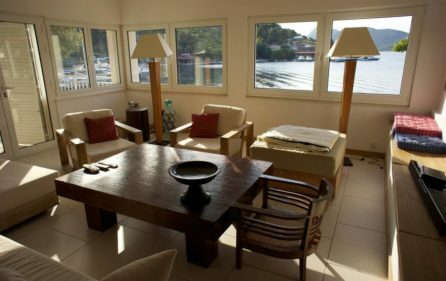 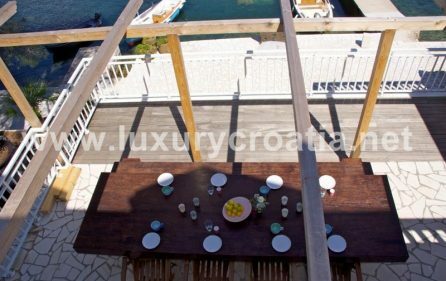 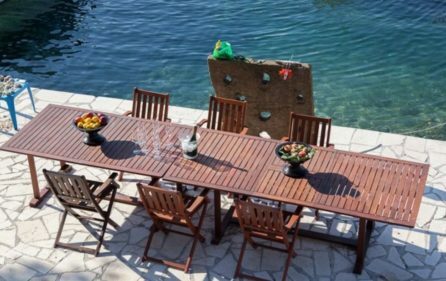 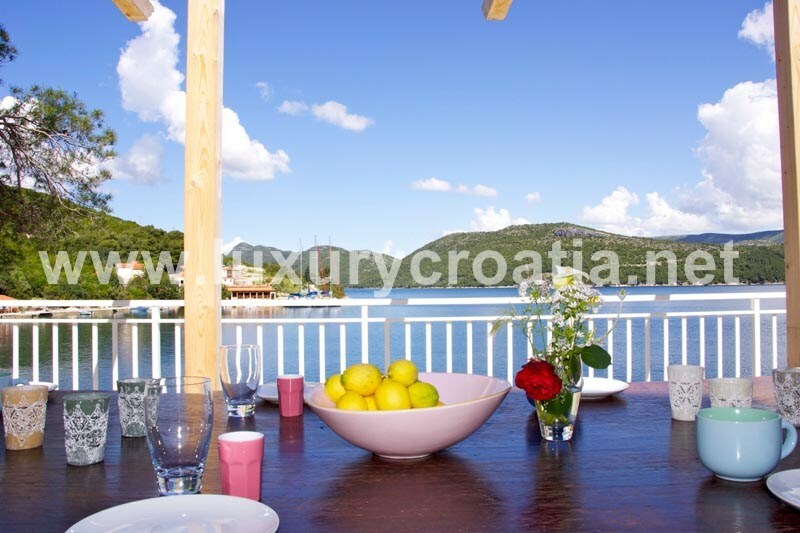 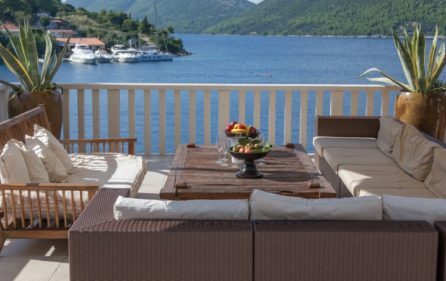 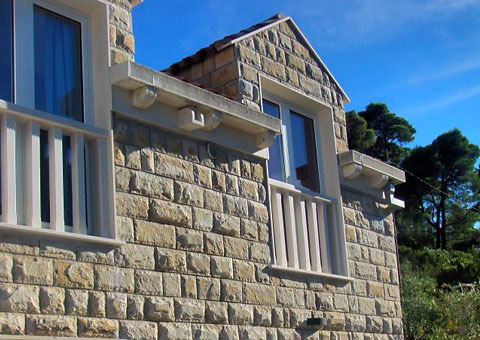 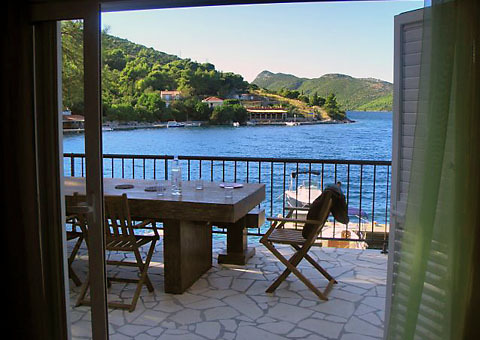 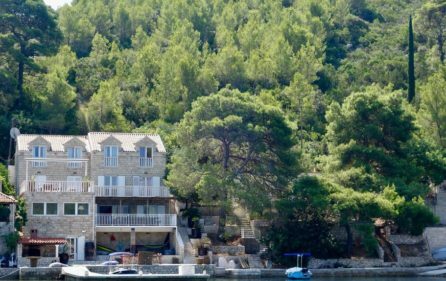 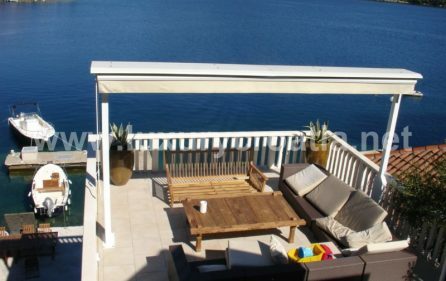 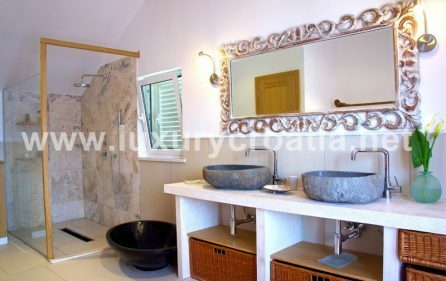 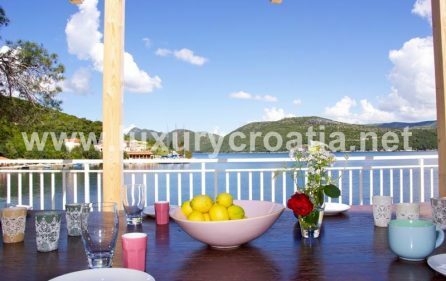 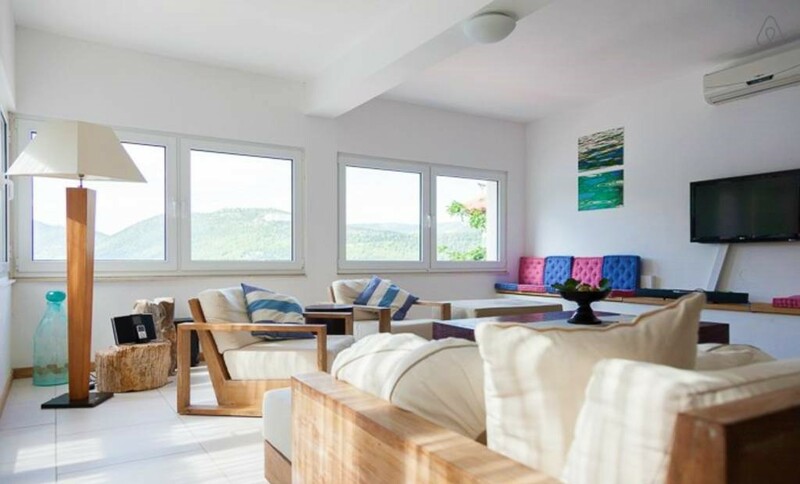 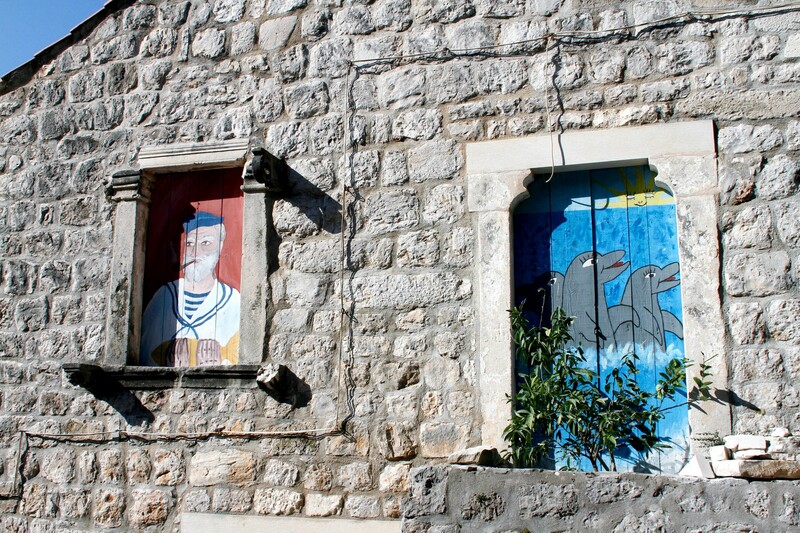 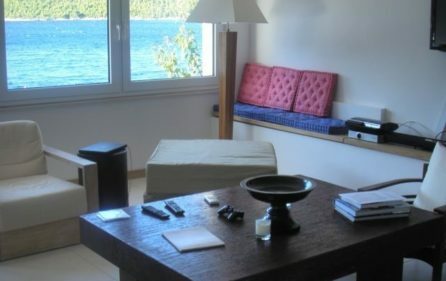 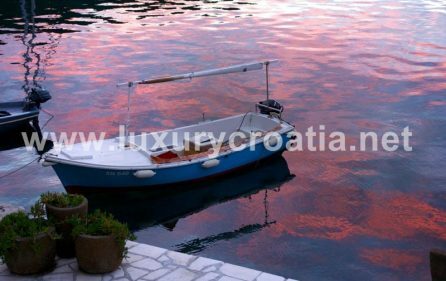 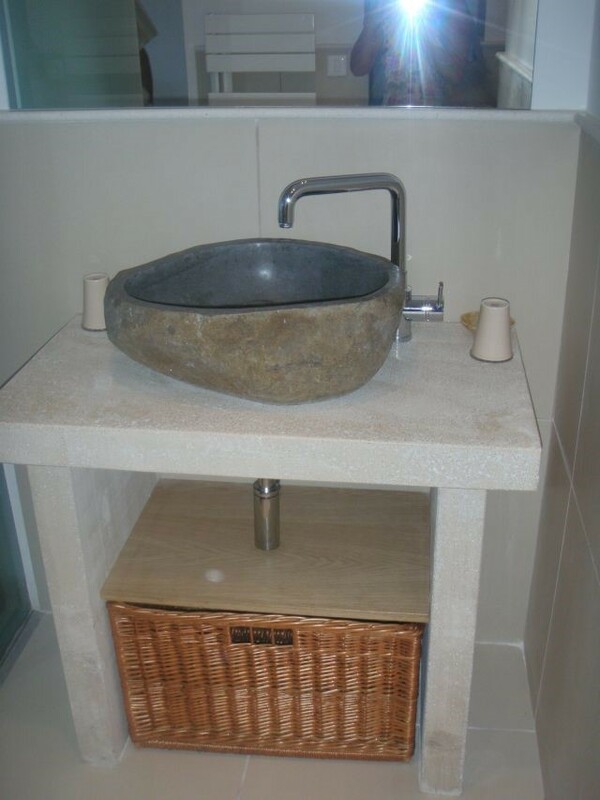 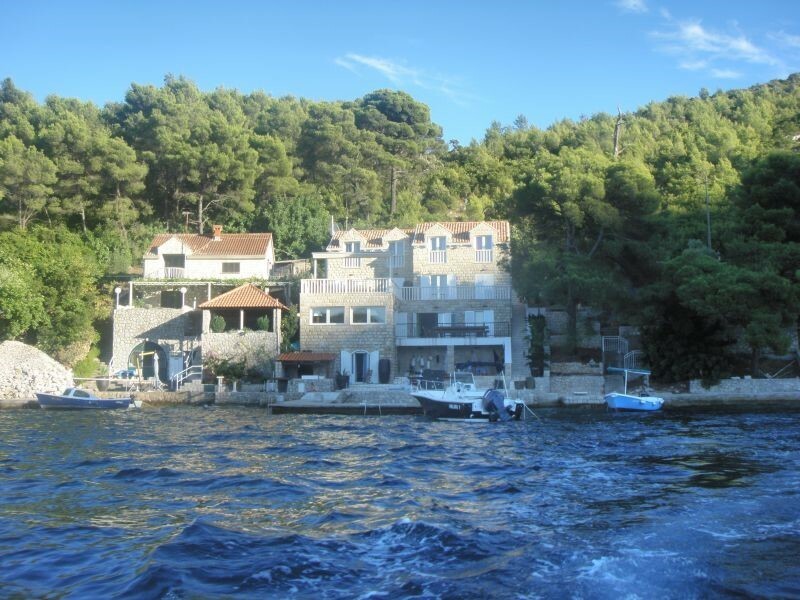 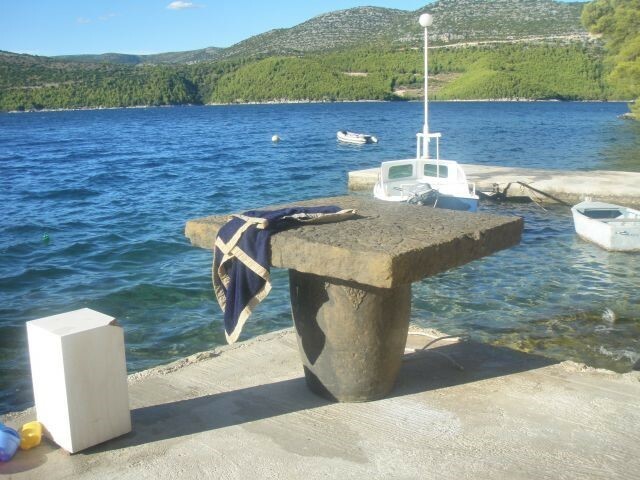 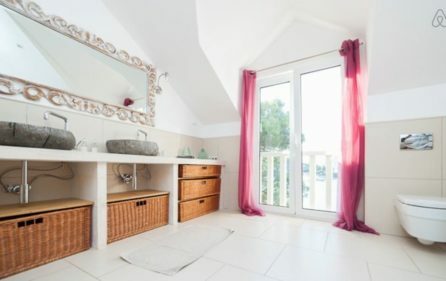 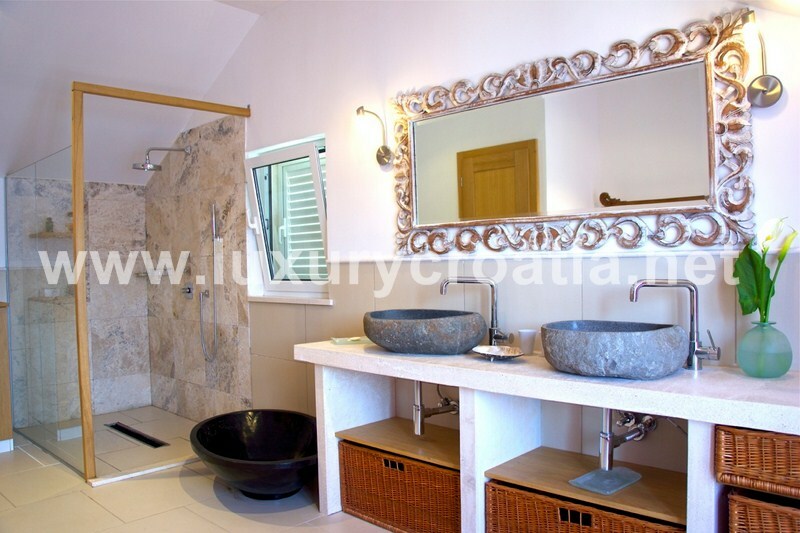 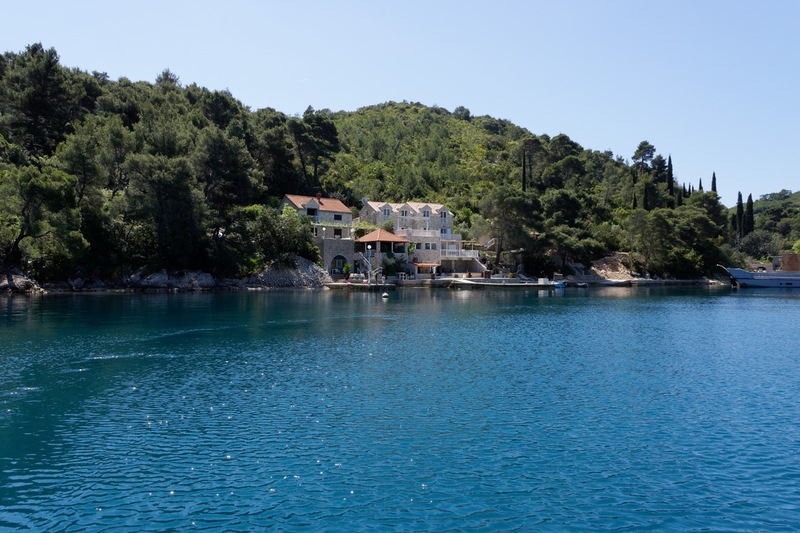 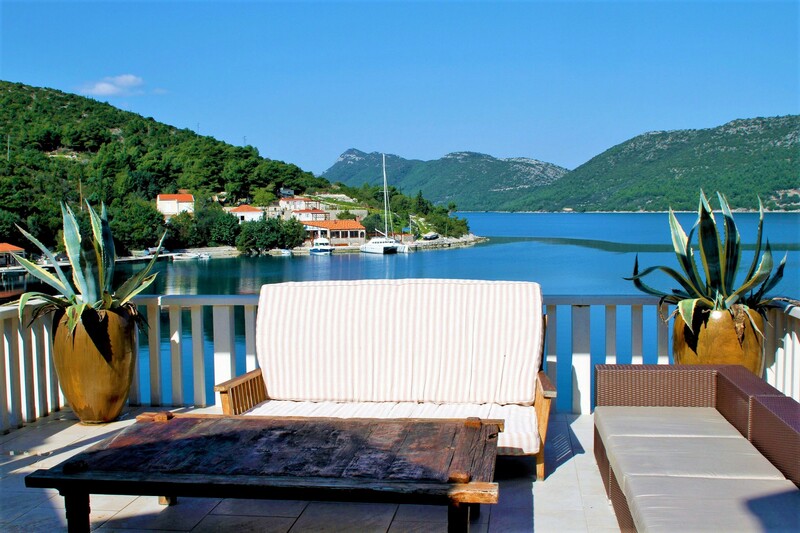 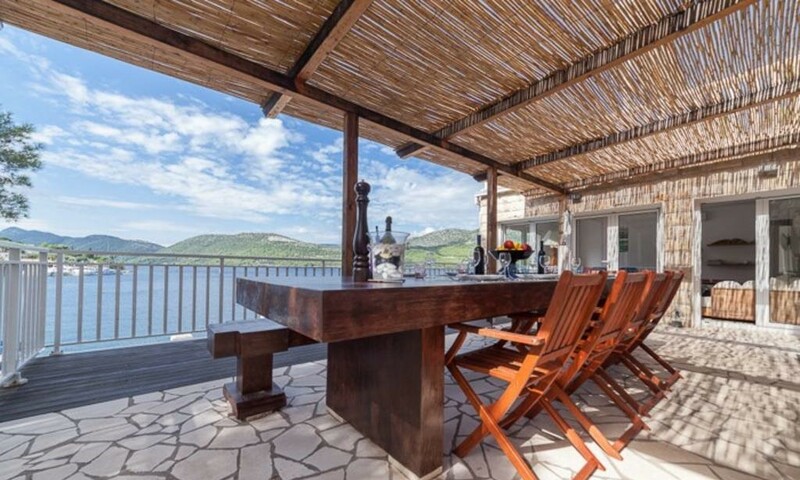 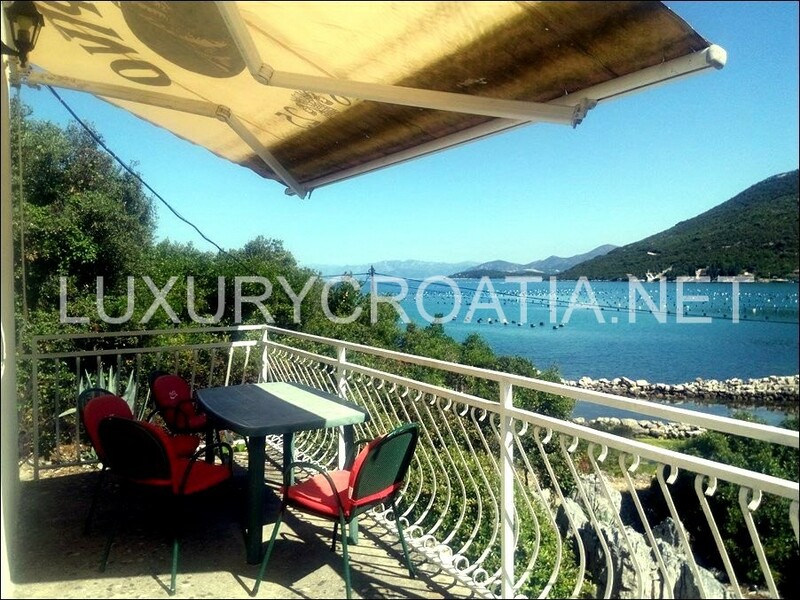 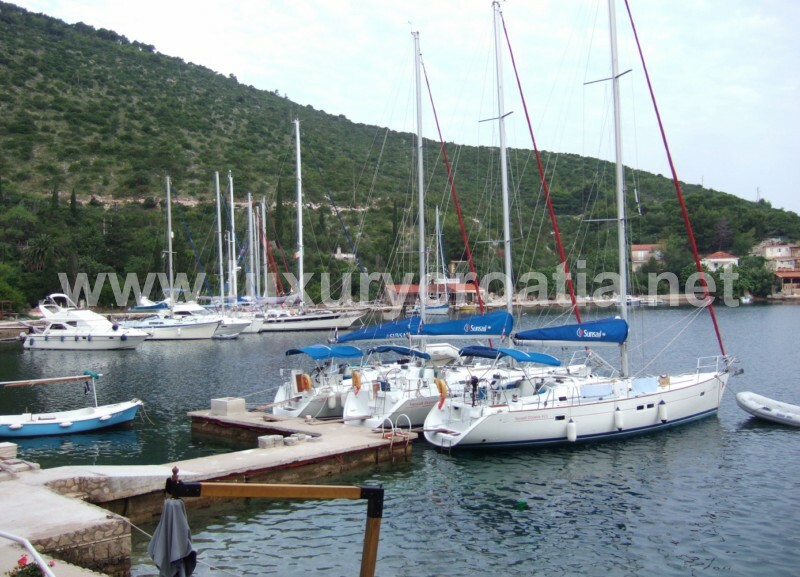 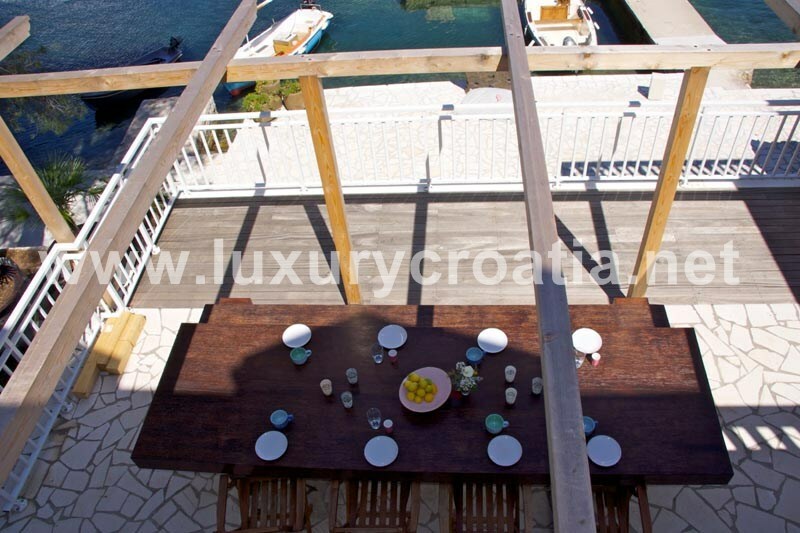 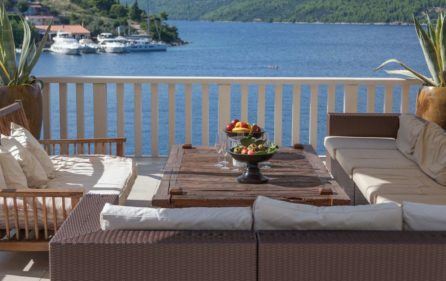 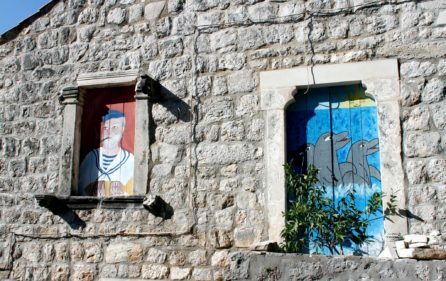 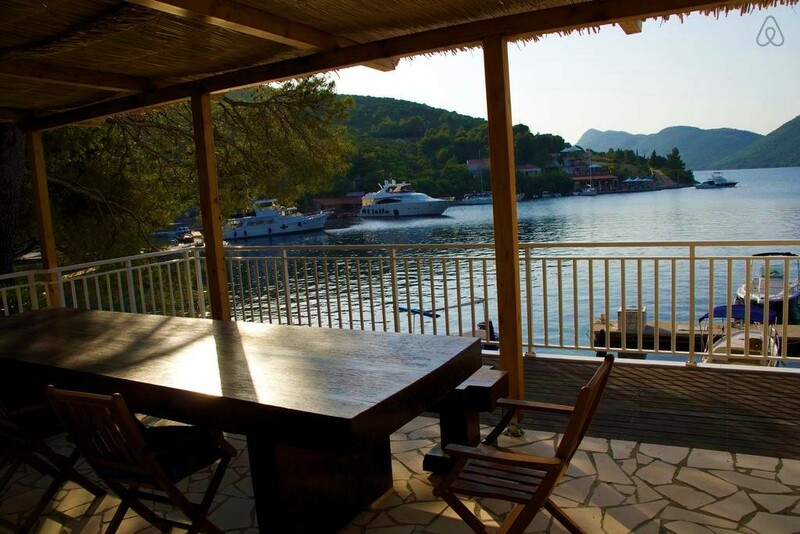 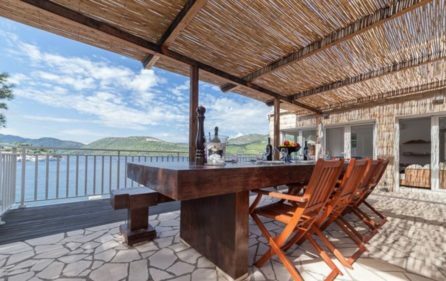 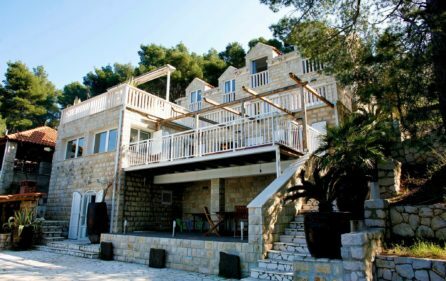 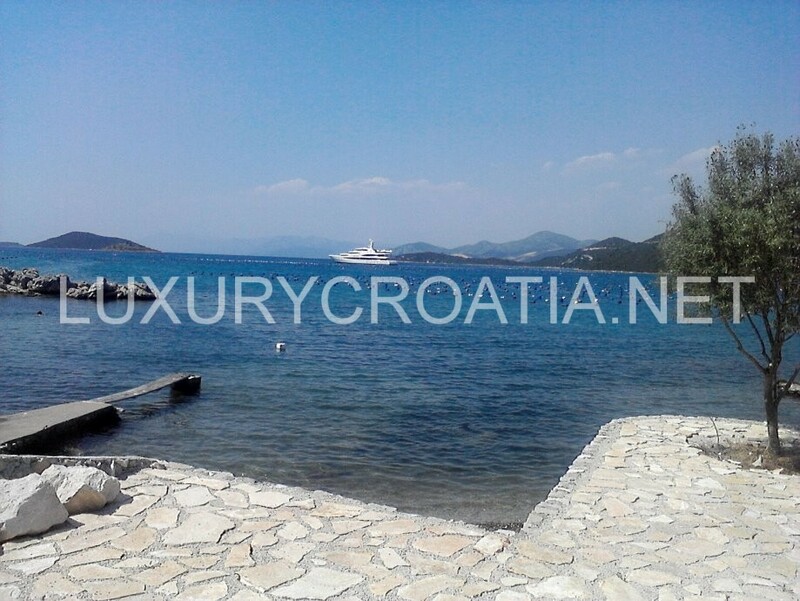 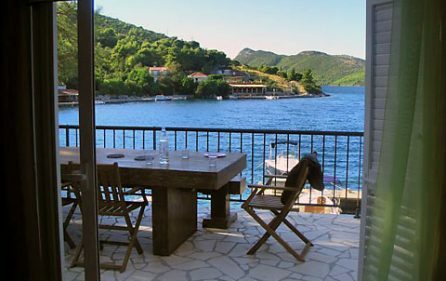 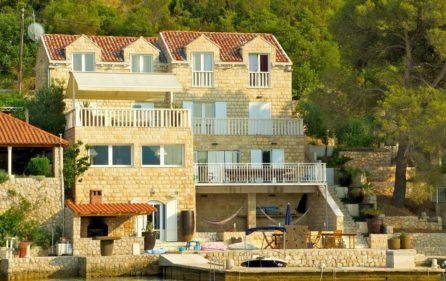 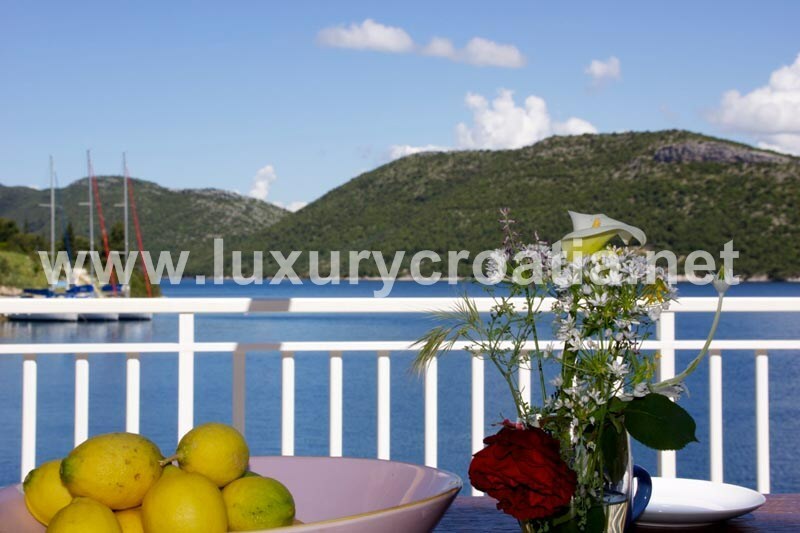 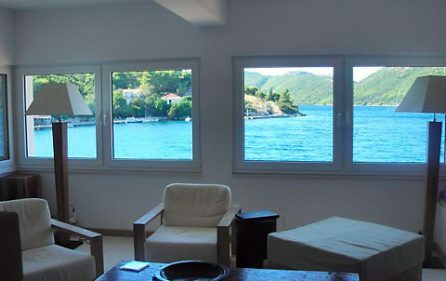 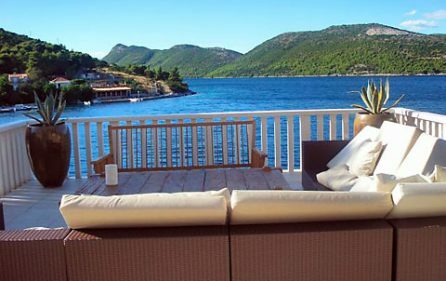 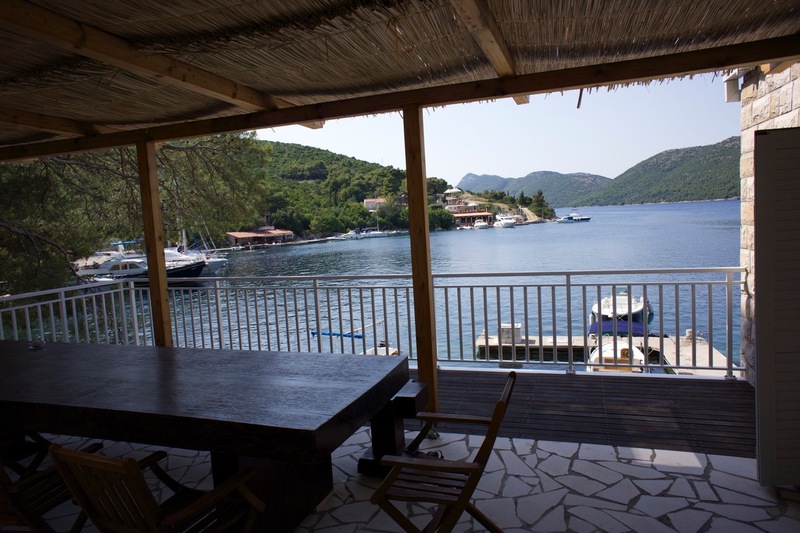 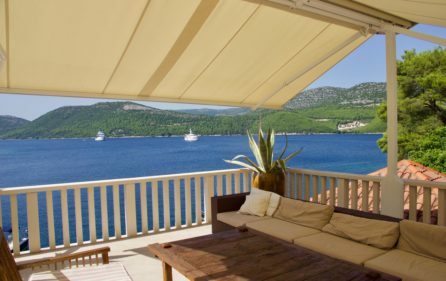 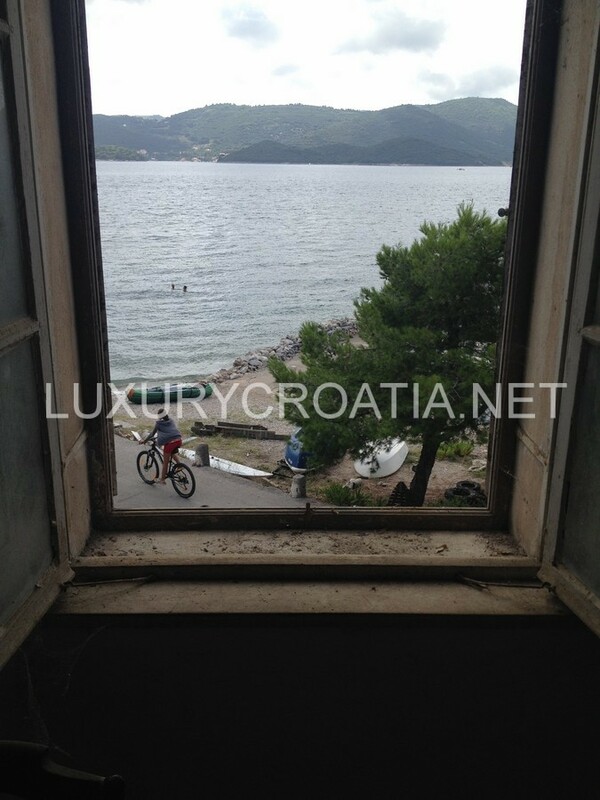 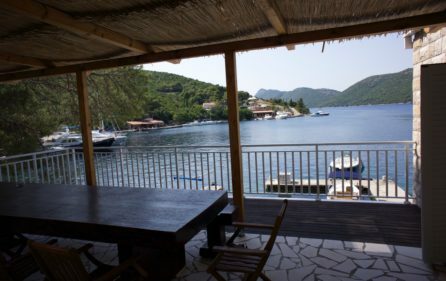 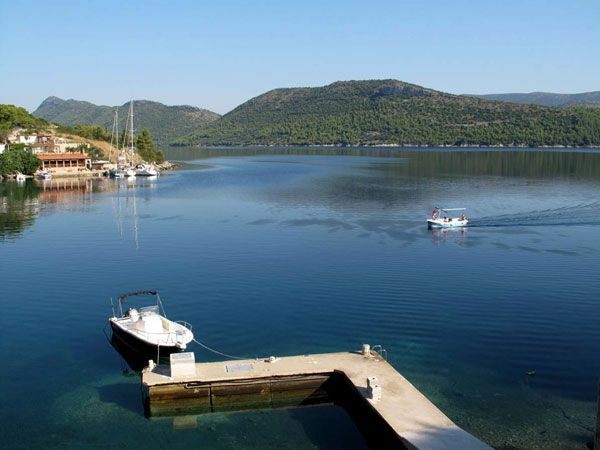 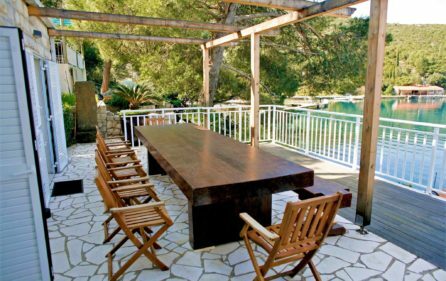 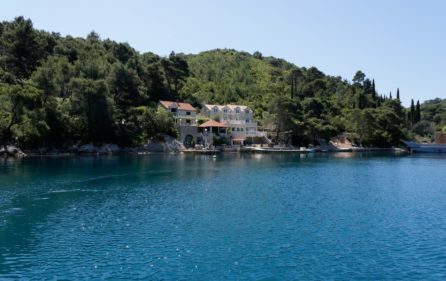 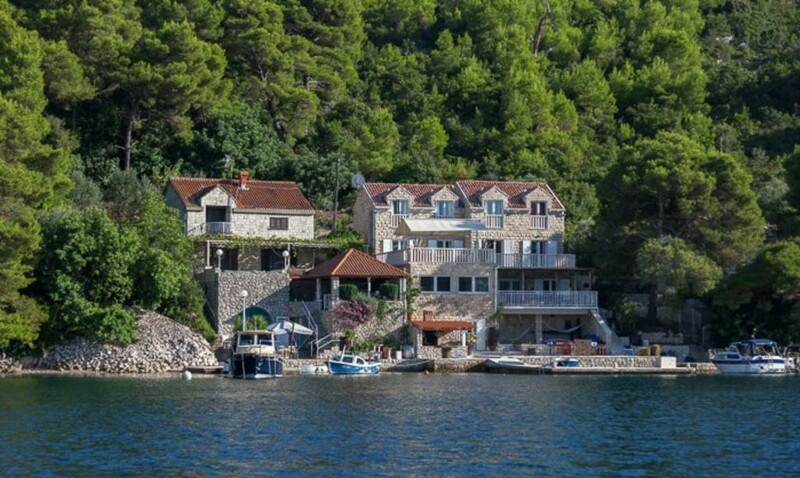 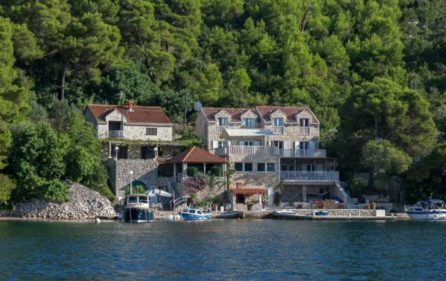 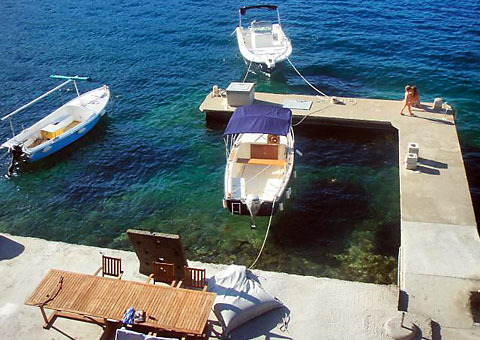 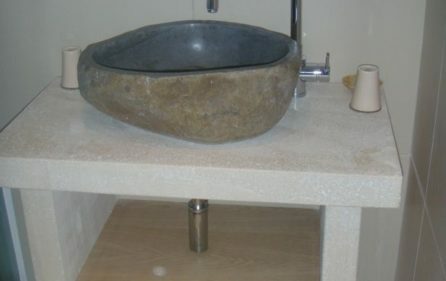 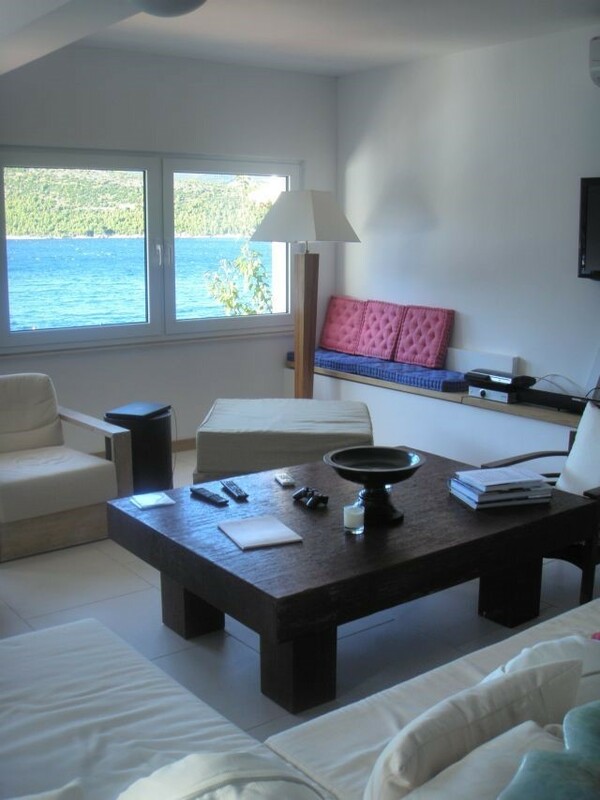 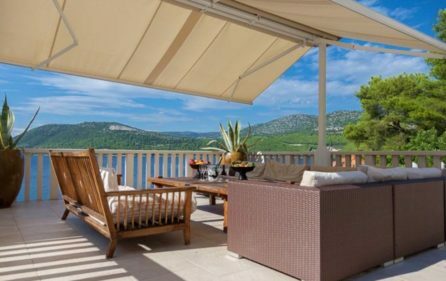 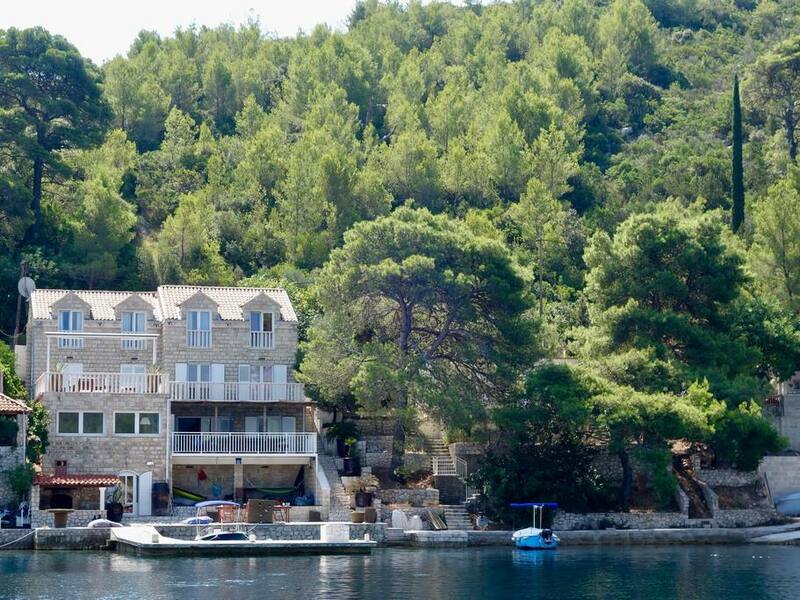 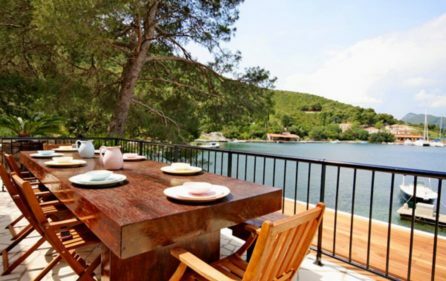 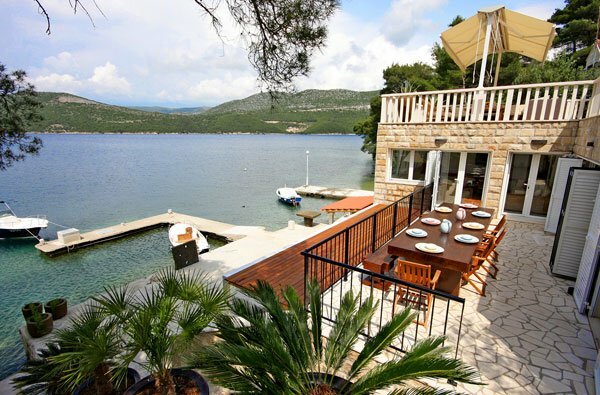 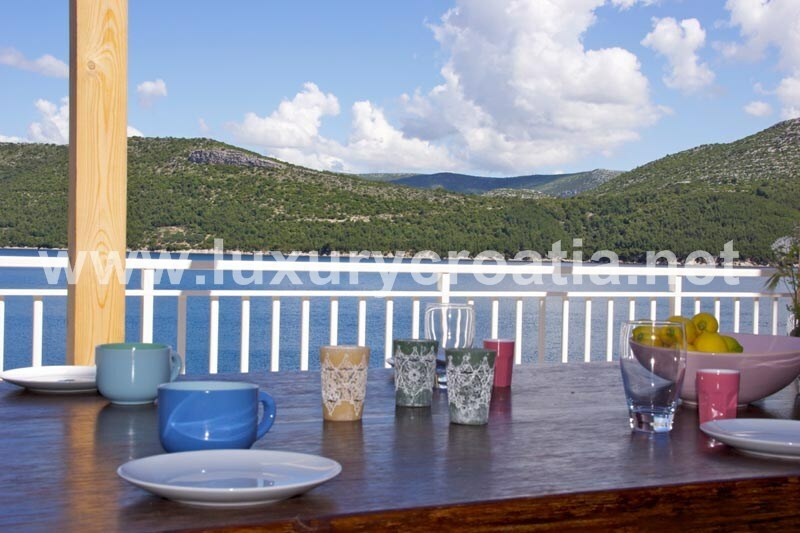 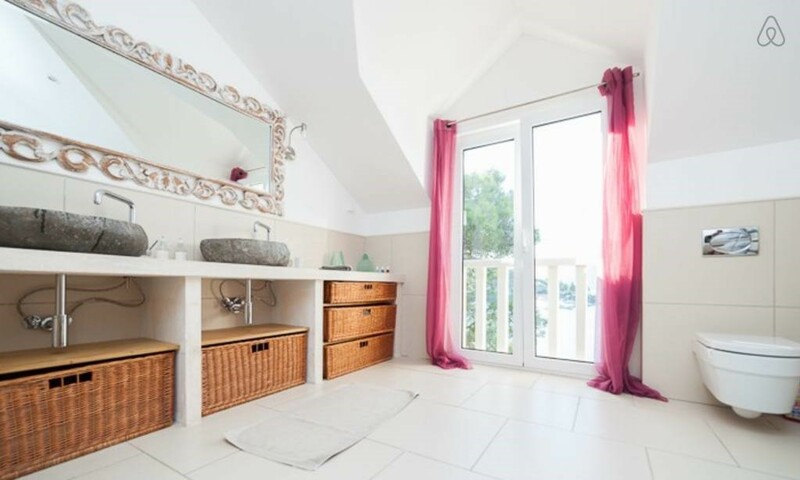 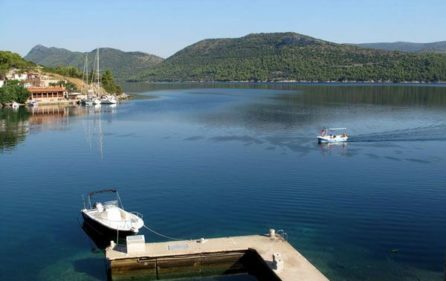 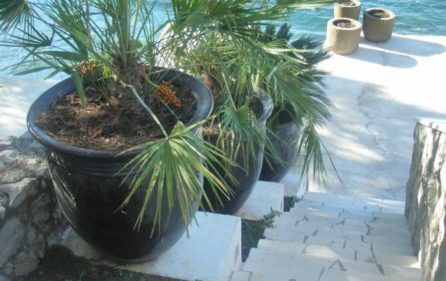 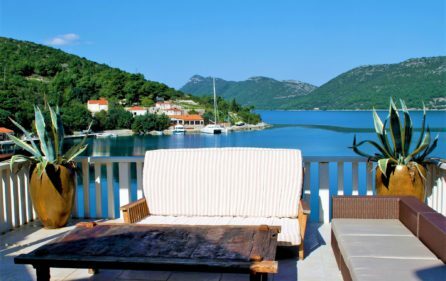 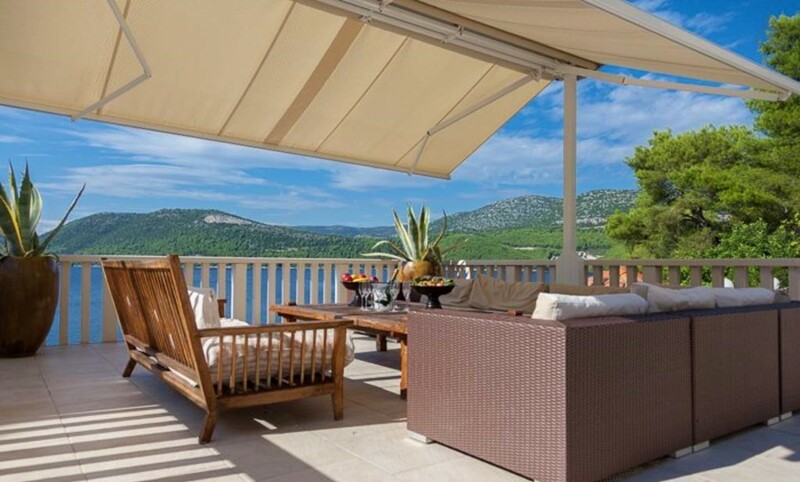 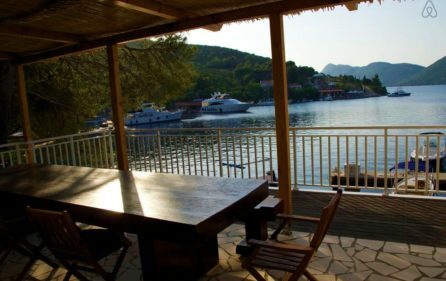 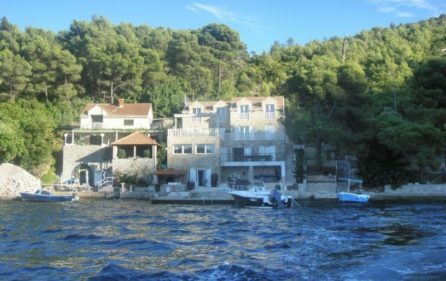 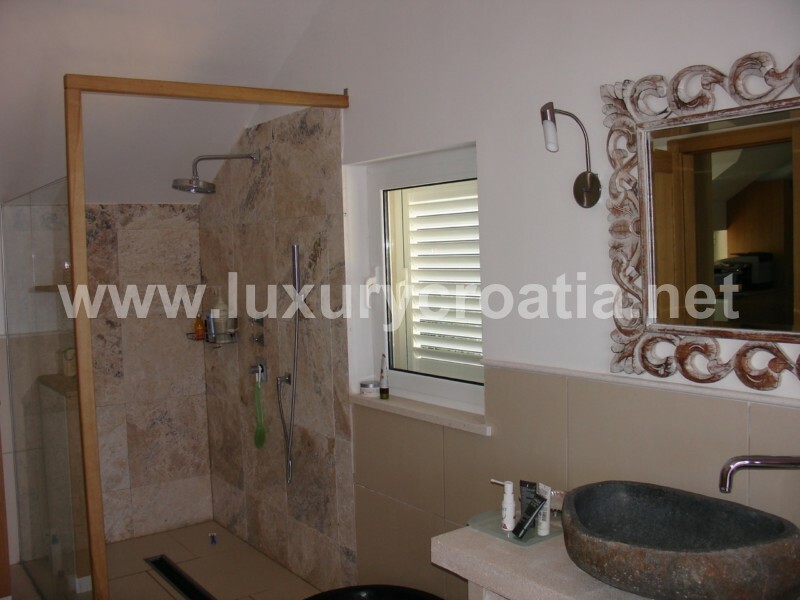 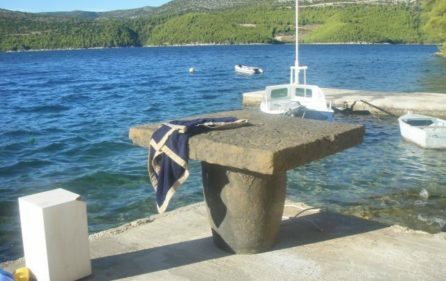 Seafront holiday villa for rent, Peljesac Peninsula is placed in a beautiful, deep bay, near marina for yachts. 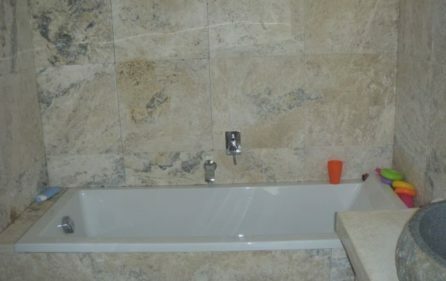 It was refurbished entirely last year. 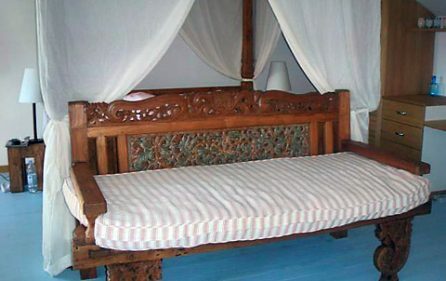 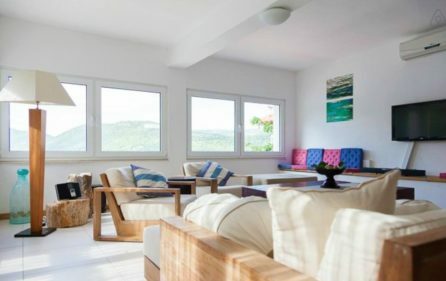 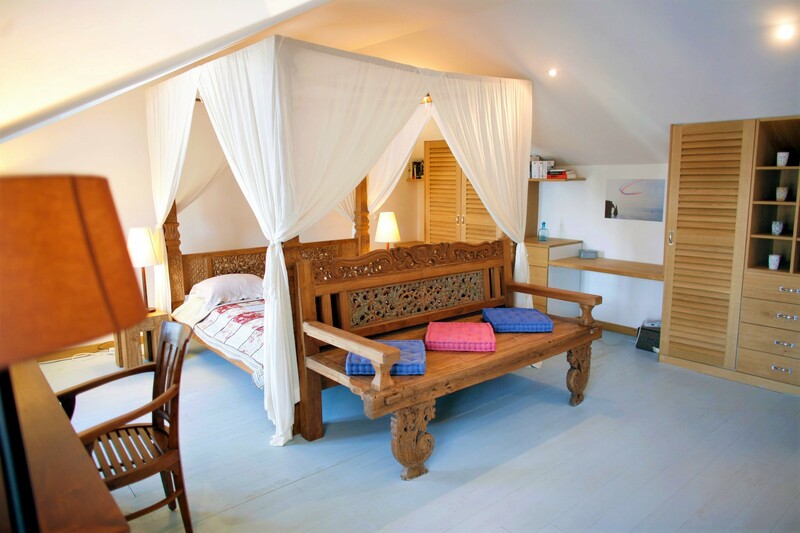 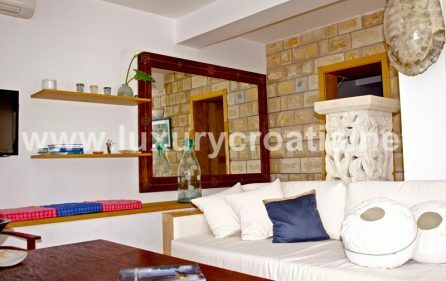 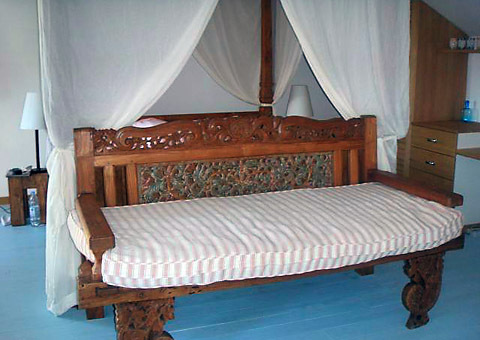 This sea view villa is fully equipped with all the necessities and most of the furniture comes from Bali. 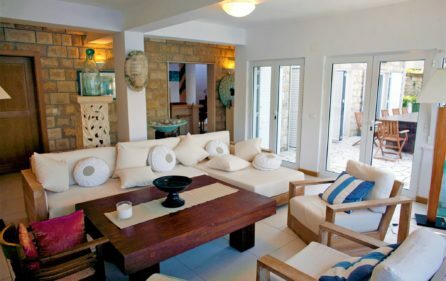 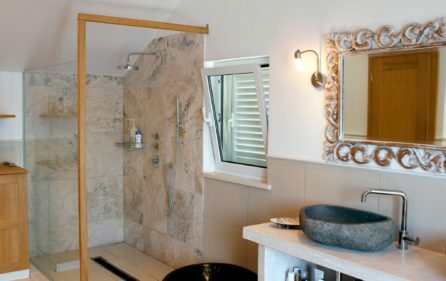 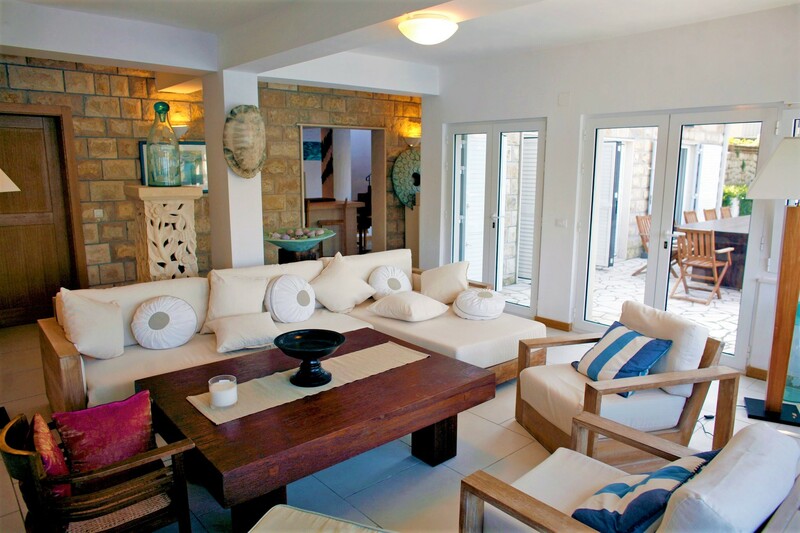 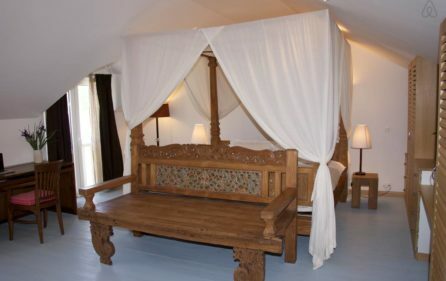 The villa can accommodate up to 10 guests. 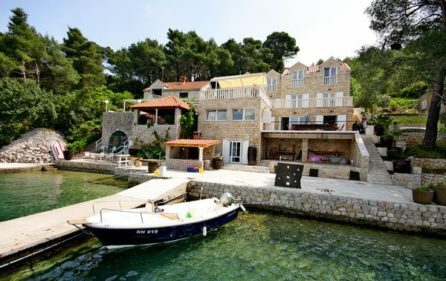 There is a road ,up to 200 meters to the house and behind the house there is a parking. 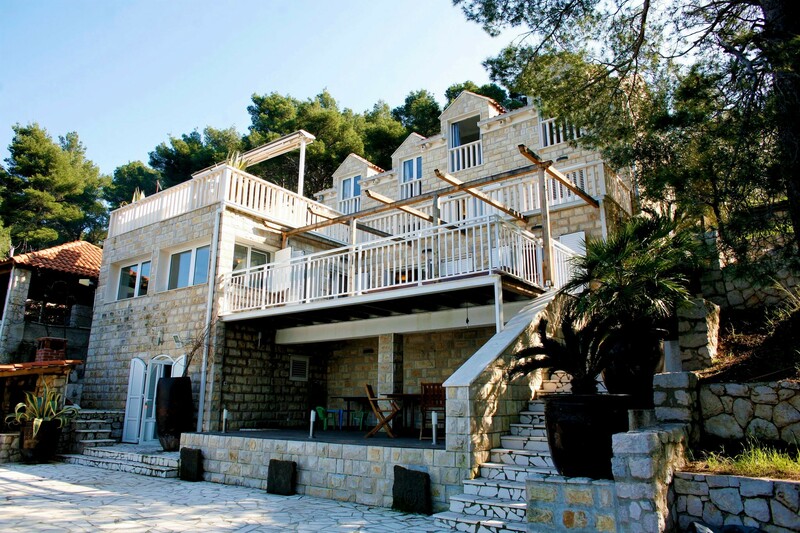 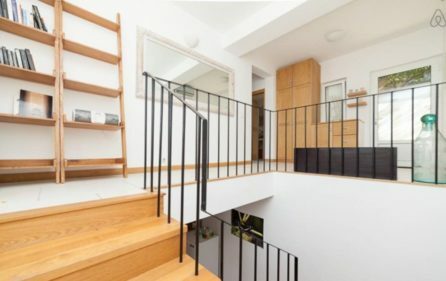 The villa is organised in 3 floors. 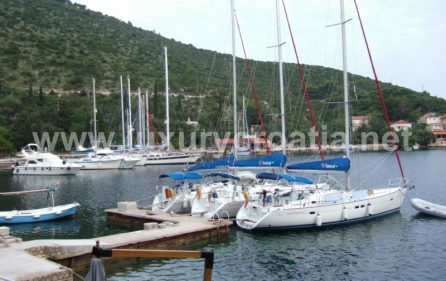 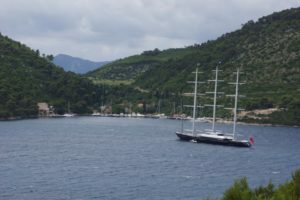 In front of the villa is a private mooring for the 2 large boats and other boats can anchor in the front as long as they do not do it on private mooring. 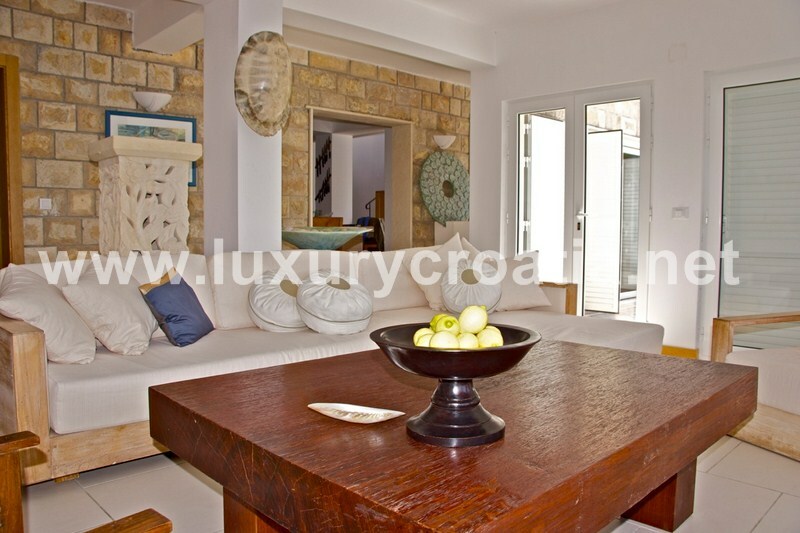 The size of the living area is spacious 370m2 , and the size of terraces are 165m2. 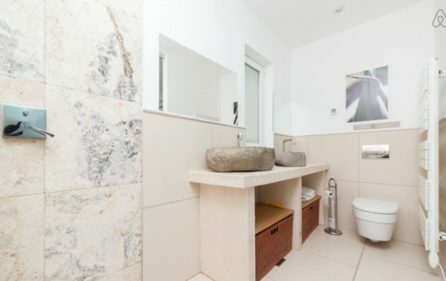 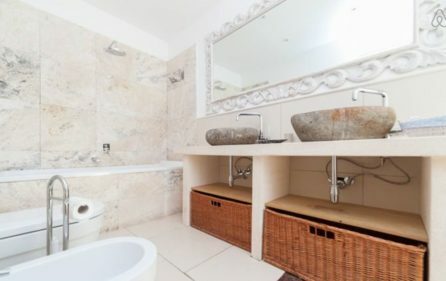 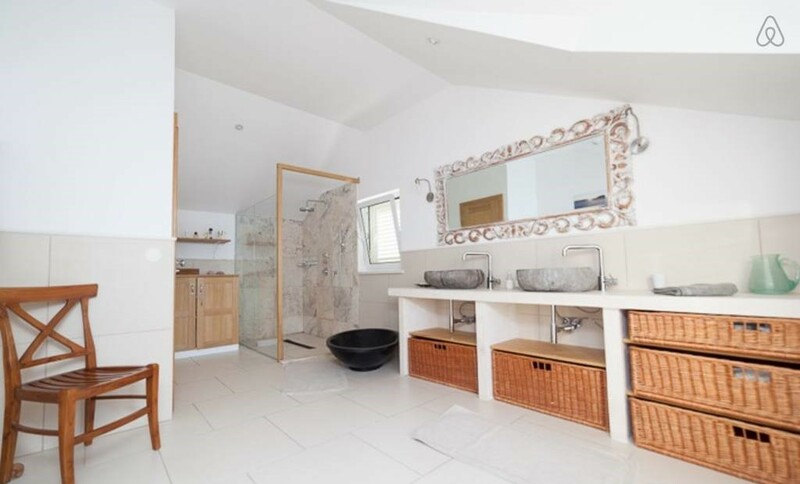 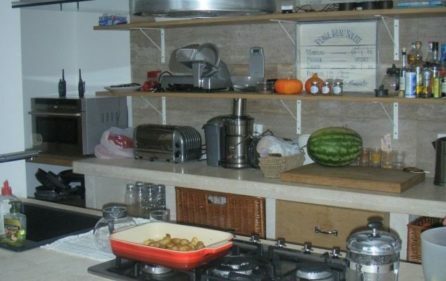 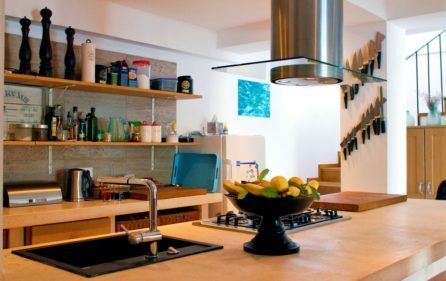 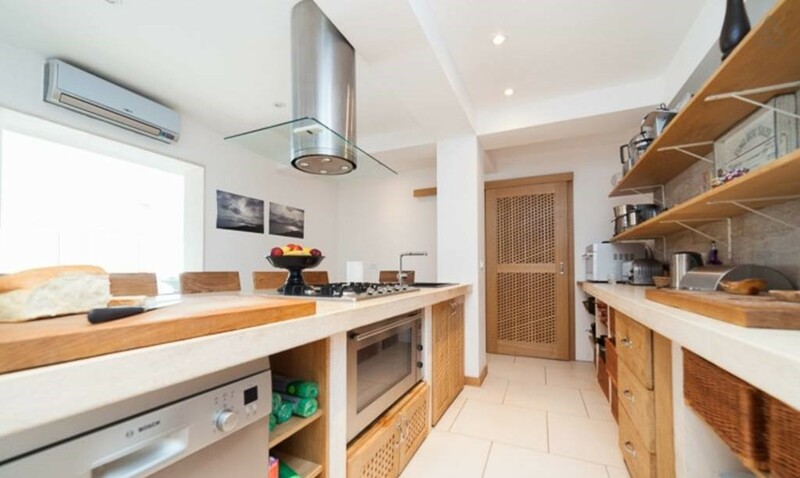 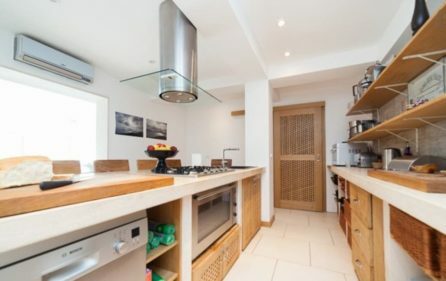 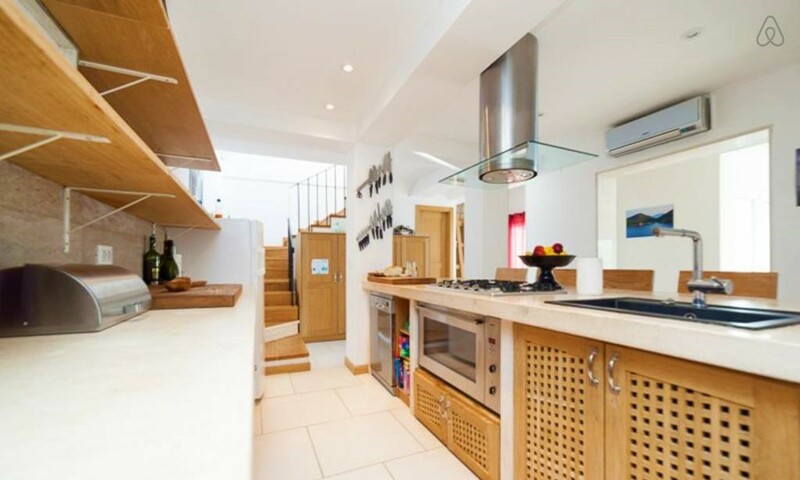 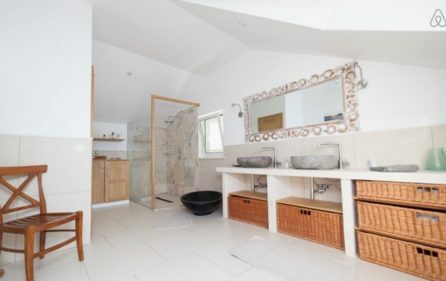 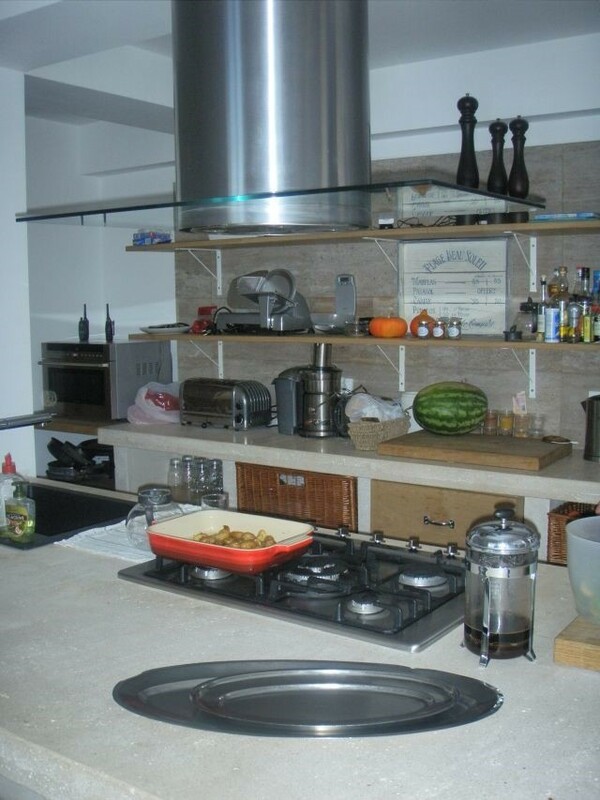 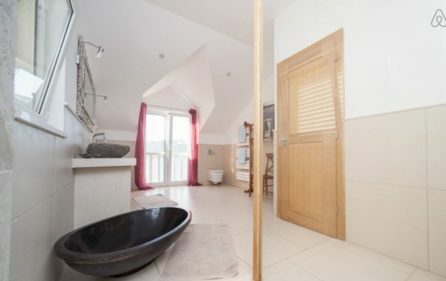 Ground floor consists of a large kitchen with toilet and storage room. 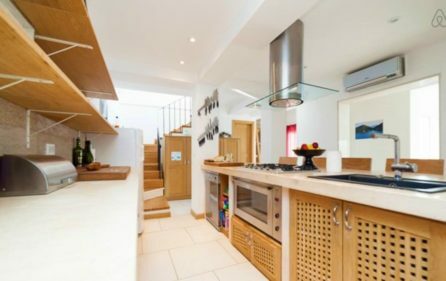 First floor has a large open plan living room with kitchen and dining room, a toilet, storage and one large bedroom with en suite bathroom. 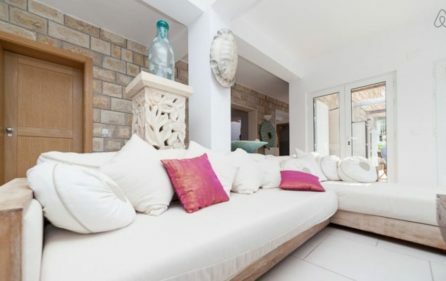 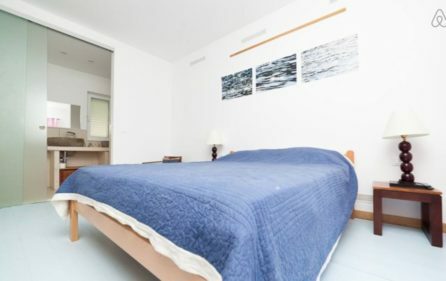 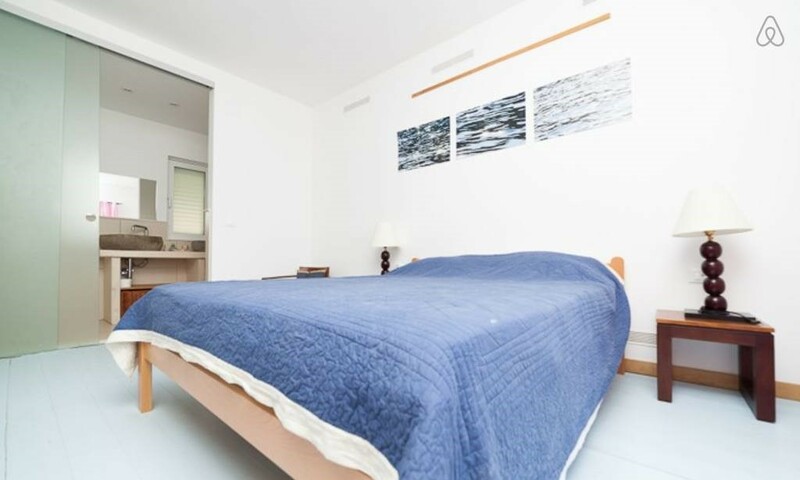 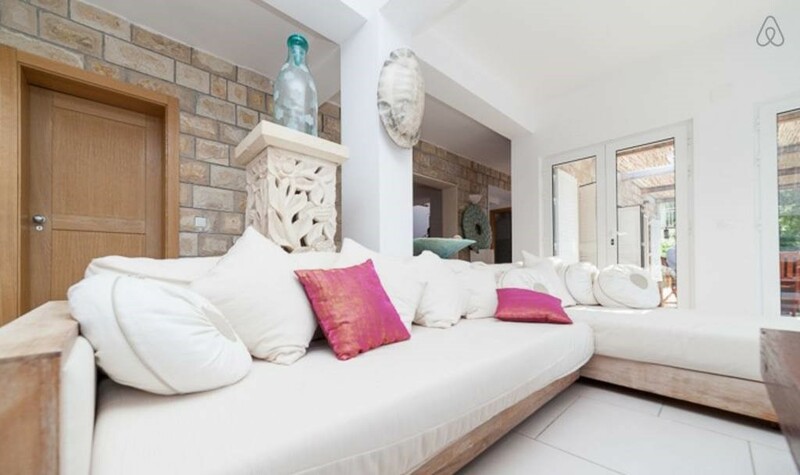 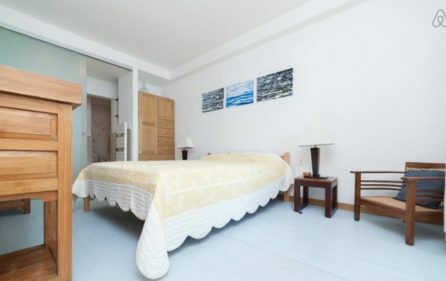 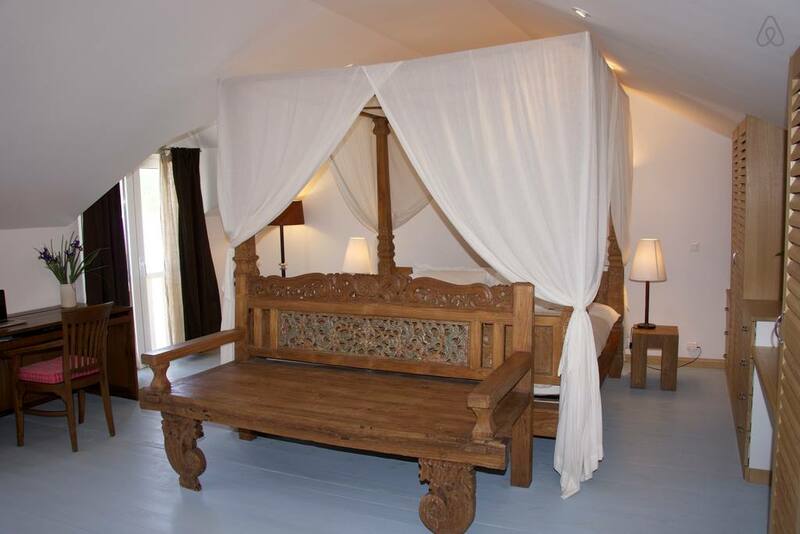 On the second floor there are 3 large bedrooms with a king size bed, 2 bathrooms and a terrace. 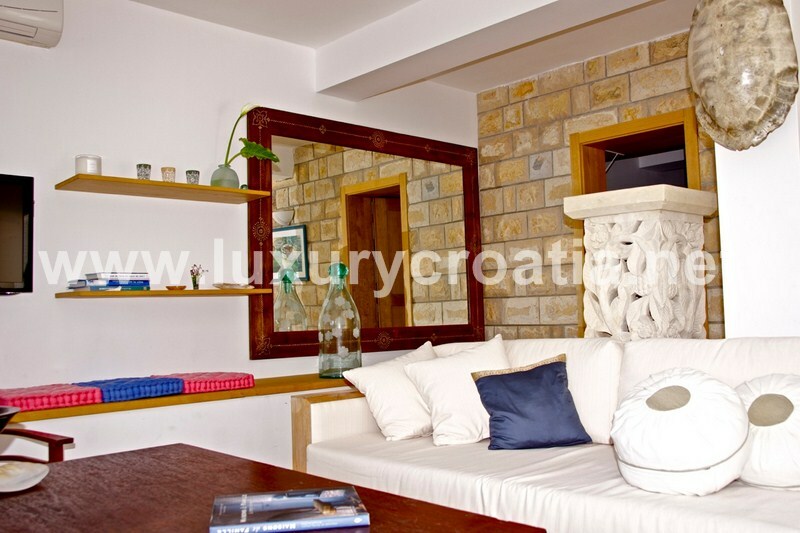 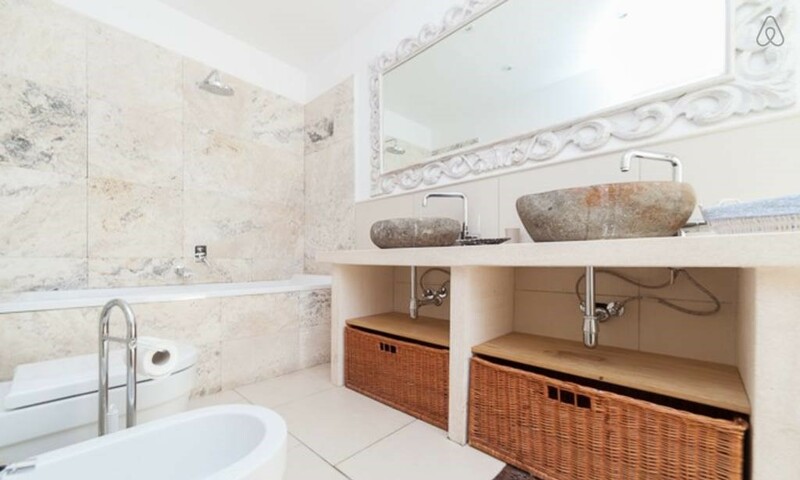 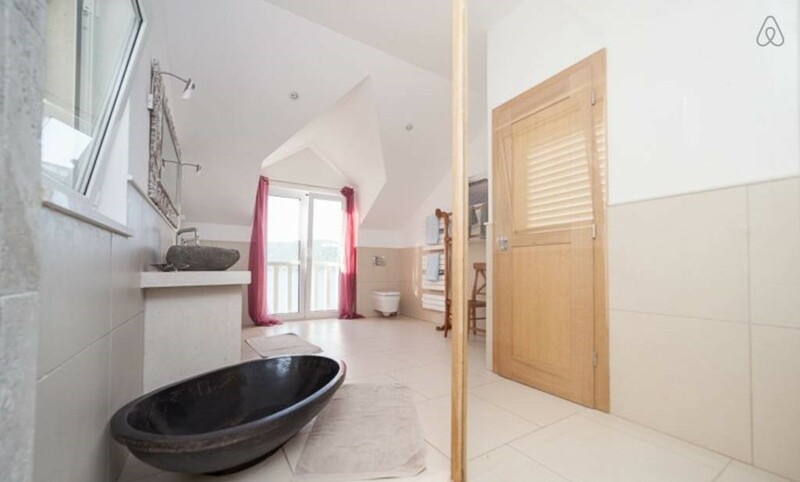 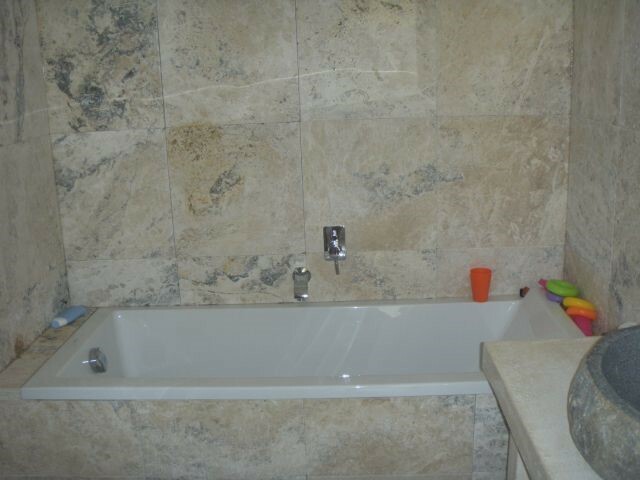 Third floor has 2 large bedrooms, with comfortable master bathroom – 18m2. 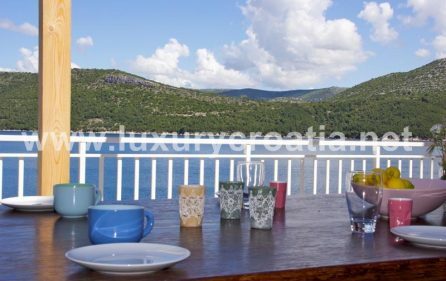 The restaurant is just 50 meters from the villa, and you can shop and find other amenities in Ston, which is 10 minutes drive away from the villa. 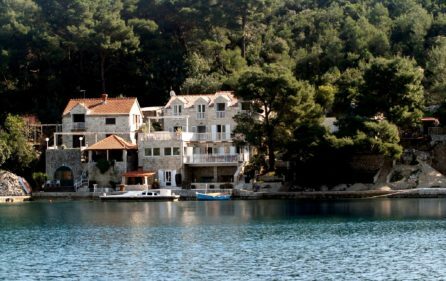 There is no road anywhere near the villa, which is located in silent bay with no more than 10 houses. 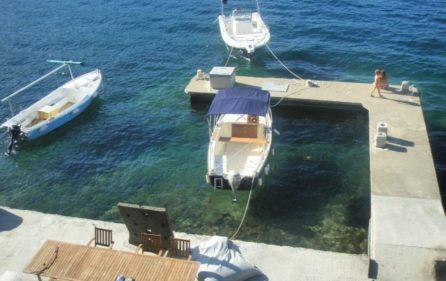 One five meter boat with a 10bhp engine is included in the price of the villa. 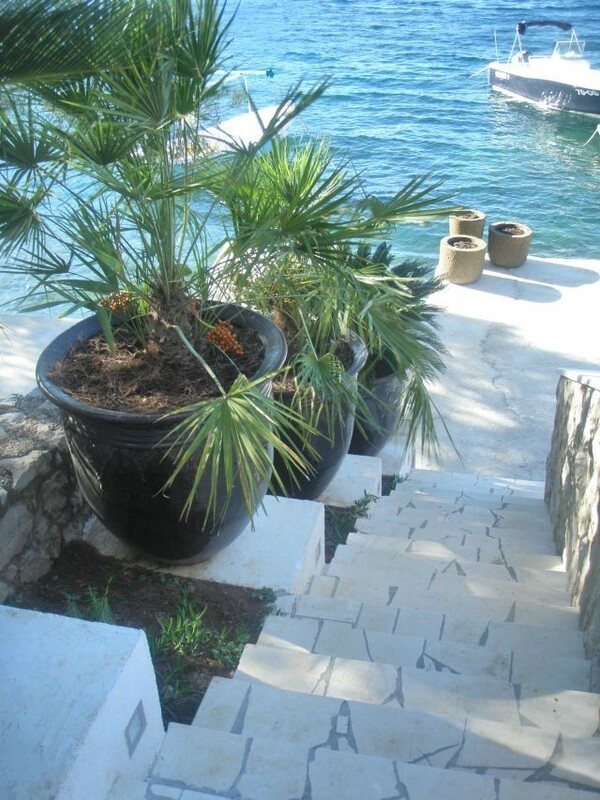 Damage deposit 500 EUR, returned on departure day if there is no damage to the property.